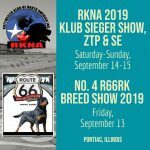 RKNA Events › Rottweiler Klub of North America Inc.
Vice President, Treasurer and Director of Regions for 2-year terms. Breed Warden is a 1-year term as it will come up for renewal in 2020. Elections will be by electronic form via email link to voting as per past elections. Please consider running for a position, submit your letter of intent by January 18, 2019, to this email address or to any Board Member. More information regarding the AGM and Election can be found on the club website in the following days. Voters and Candidates must be members in good standing. RKNA Inc. Klub Sieger, Breed Show. ZTP, SE and ADRK BSE offered. Two Judges to be announced.